The Historical Society’s newest exhibit, Suffrage Centennial: Women’s Place in Society has caused two community members to come forward and donate relevant artifacts. The new objects add yet more color to the exhibit and are now on display at the museum. One object recently brought in is a large board that has pages of a petition from 1917 glued to it. 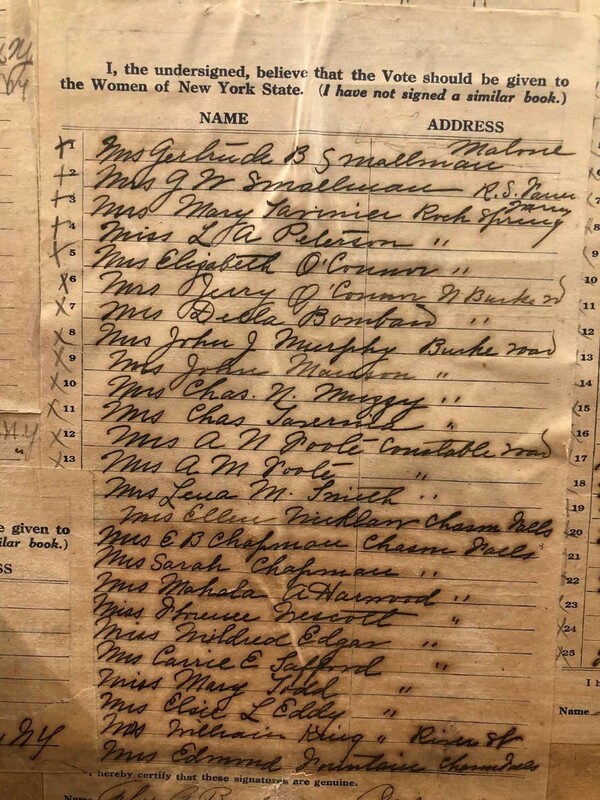 The petition says: “I, the undersigned, believe that the Vote should be given to the Women of New York State.” There are more than one hundred women’s signatures and addresses from Franklin and Essex County; including such towns as St. Regis Falls, Paul Smiths, Harrietstown, Malone, and Bloomingdale. This item was found underneath the floorboards of a house in Saranac Lake undergoing renovations this summer! Rich Fitzgerald luckily recognized the value of the discovery, contacted the Society, and donated this interesting piece of history. Come see if your forbearer signed the petition. Ben and Conni Cross donated another item that was immediately added to the exhibit. 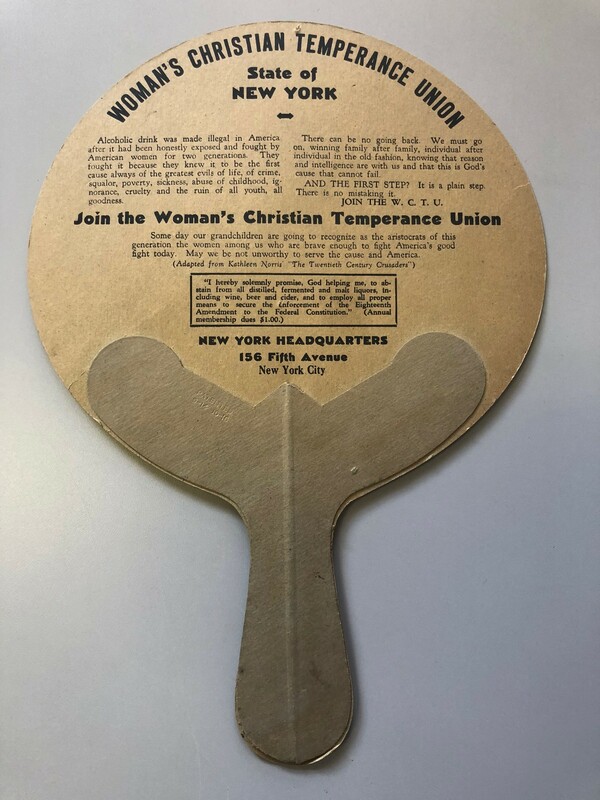 A cardboard hand fan depicts an idyllic family and their home, but the flip side tells a different story… It is an advertisement for The Women’s Christian Temperance Union (WCTU). The WCTU was the women’s branch of the Prohibition Party which had been founded in 1869. The Prohibition Party was the first to accept women as party members, and gave women at its first national convention full delegate rights. Women’s suffrage appeared on the Prohibition Party platform in 1872. In contrast, women’s suffrage did not appear on the platform of either the Democratic or Republican party until 1916. The 19th Amendment to the U.S. Constitution, giving women the right to vote, finally passed in 1920. The WCTU led the fight for the 18th Amendment to the U.S. Constitution (Prohibition) and in 1919 the country officially became “dry”. The WCTU went on to become more influential than the Prohibition Party itself. It was the largest women’s organization of the 19th century and campaigned for women’s rights, prison and labor reform, public support for neglected children, and peace, as well as the ban on alcohol. These two newly donated artifacts are on display as part of the Suffrage Centennial: Women’s Place in Society at the History Museum, 242 Station Street. On both the 6th and 7th of October there will be special tours of the storage and curatorial areas of the collection. The public will have a chance to see artifacts that are not on general display and get a peek into the “backstage” workings of the Society. This opportunity is part of the New York State Path Through History Weekend event. The museum closes for the season at the end of the day, Sunday, October 7th, 2018.